Sometimes, WooCommerce store owners want to add shipping insurance to more expensive orders. In this article, I’ll show you how to do it with a free version of Flexible Shipping plugin, and share with you a ready-to-use file with the presented example, that you can import to your own store. Adding the cost of insurance to shipping price for more expensive orders is really easy to configure. I’ll show you how to do it in a few easy steps. All you need is an excellent plugin to control shipping methods. And what can be better than our Flexible Shipping? First, you have to download the free version of our favourite plugin – Flexible Shipping. You can use it to add shipping insurance in WooCommerce, but it has a lot of other features, even in the free version. For example, you can use FS Connect, service that allows you to connect your store with carriers’ system to speed up your shipping or automate it completely. Interested? You can read more in one of my previous articles. When you have Flexible Shipping installed, you’ll have to configure it. Don’t worry; it’s very easy – you can check our guide on how to do it. I’ll show you how to do it in one example. You have a shop which ships products to customers, and you’d like to ensure every package worth more than $100. It’s an additional cost for you, so you want to add the extra cost of shipping for customers. Let’s assume that insuring packages cost $5. Go to WooCommerce → Settings → Shipping, choose shipping zone you want to edit or add new shipping method. Remember, it has to be a Flexible Shipping kind of method. Now you can add a rule based on the Sum of the cart and set: Min – 100 and Cost per order – 5. Click Save Changes. Now, when the customer’s order exceeds $100 insurance cost will be automatically added to the shipping price. As I promised, you can download ready-to-go CSV file with that configuration. You can import it while editing the shipping method. Click on Import, select downloaded file, and you are ready to go. If you want to change the cost of insurance or any part of the configuration, you can also import this scenario, and adjust it to your requirements. 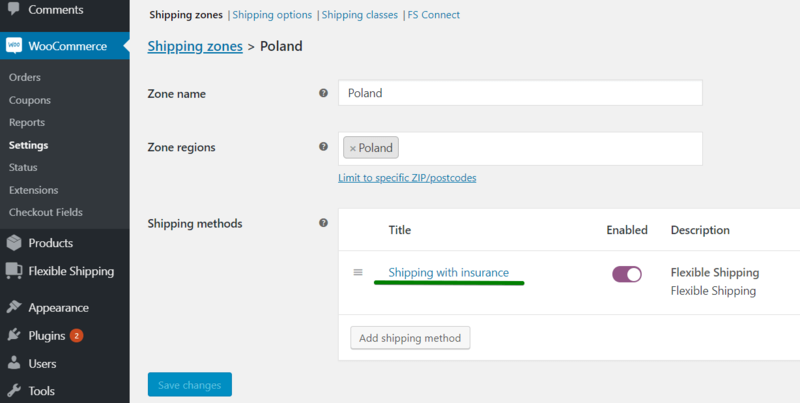 Home › How to add shipping insurance in WooCommerce?